Our food on our plate. How easy is it to look at it and forget how it got to us, right? We are spoilt in that way I guess, because everything is a little "easier" but it also does us a disservice because we don't see or REALLY grasp the impact of the production of our products or food. How did that cow get fed? How much did she or he need to eat? How did that food get to them? What land was used to grow the food? How was that food grown? How much water was used to sustain her/him while she was alive? What waste was created in the process? Who was on that land before? Oh too many questions to ask when you are hungry I KNOW! But not too many to ponder when not. These unseen parts of the puzzle all have an affect on our planet and our future. A big one. HOW AND WHAT DO WE FEED THE 70 BILLION ANIMALS WE "GROW" EACH YEAR TO THEN EAT? I know there is still the belief out there that the majority of the domesticated "livestock" eat grass, like they would naturally if they had the space and time to roam open green fields. In Australia cows still retain this most of their lives until being sent to feedlots to fatten them up, but the majority cattle are no longer raised like this - they are on factory farms. As for the pigs and any poultry - they are well and truly in sheds across the globe apart from the very very minority of organic pasture raised farms. These animals in factory farms then have to be fed because they do not have the opportunity to graze or scavenge for their own food - they have to eat what they are given. And they are given what makes them grow the quickest and costs the least, because in 90 percent of situations now, raising animals for food has turned the animals into commodities and it is a profit-driven market. They are therefor fed mostly corn and soy, and other concentrated feedstuff like rapeseed, wheat, fishmeal or other grains as they cause animals to quickly reach market weight, and are much cheaper than other food options – often due to government subsidies such as in the US. Globally 90% of soy and 80% of corn is fed to livestock....And this corn and soy take space to grow. A lot of space. If we were to use that space to grow grains or vegetables to feed people it would be WAYYY more efficient... A new report published in the journal Science, shows that without meat and dairy consumption, global farmland use could be reduced by more than 75% – an area equivalent to the US, China, European Union and Australia combined – and still feed the world. Yep, crazy right. The new analysis shows that while meat and dairy provide just 18% of calories and 37% of protein, it uses the vast majority – 83% – of farmland. 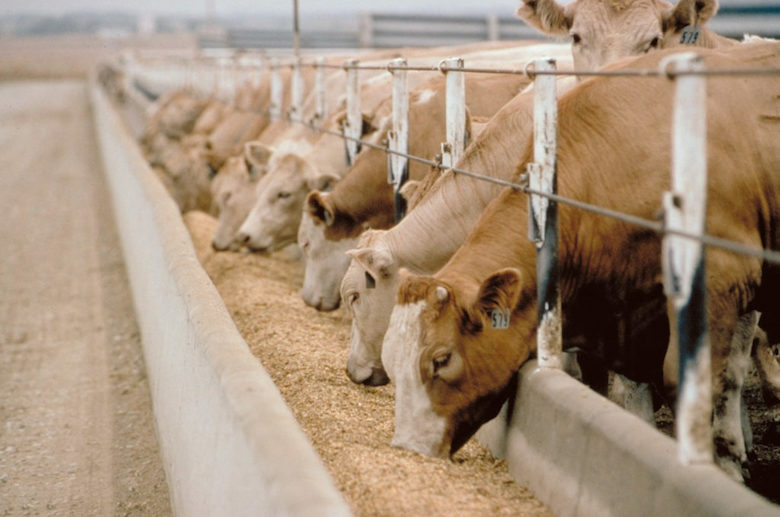 The growing concern is that to grow this animal feed, companies are now also grabbing land in poorer countries, such as South and Central America. For years now, rainforests have been cut down for the number one reason of cultivating soy - not for tofu burgers, but to bulk up the animals that are crammed into unnatural conditions on factory farms elsewhere. Not only is it a disaster for greenhouse gas emissions but these monocultures, that are normally GMO, use huge amounts of pesticides and also are number one killers of biodiversity. Crop spraying has polluted important water sources in many rural regions, poisoning what wildlife is left there, threatening plant life, and resulting in a number of health problems in people, including diarrhoea, vomiting, genetic malformations, headaches, loss of sight and even death. By going into these poorer countries and claiming the land to grow animal feed, it also means displacement for the local people, smaller family farms and as it is about profit, the grains grown don't go to the local people , even in the places where they are starving. They are exported to the western countries with the ever-expanding waist lines and a growing desire for flesh. In simple terms, meat production is highly inefficient, particularly when it comes to red meat. To produce one kilogram of beef requires 25 kilograms of grain – to feed the animal – and roughly 15,000 litres of water. Pork is a little less intensive and chicken less still, which is what environment champion, Leonardo DiCaprio explores in the snippet below. There are 7.5011 billion people on earth Based on rough averages of water at .5-1 gallon (.75 gallons) x 7.5011 billion = 5.626 billion gallons of water and 7,605 metric tons of food produced per minute = 24.143 billion pounds of food per day. If you are ready for the challenge why not give the 21 Compassionate Kitchen Guide a go? It is free to download on the blog, filled to the brim with information and has printable pages to help you cut down on your meat intake. Do it with a friend to make becoming more environmentally friendly fun!